I am a full-time consultant and provide services related to the design, implementation and deployment of mathematical programming, optimization and data-science applications. I also teach courses and workshops. Usually I cannot blog about projects I am doing, but there are many technical notes I'd like to share. Not in the least so I have an easy way to search and find them again myself. You can reach me at erwin@amsterdamoptimization.com. Perhaps it is not really a GDX file ! This happens when a new GAMS system (22.6 or newer) is used with an old GDX2HAR (or ViewHar) tool. The tools included in GEMPACK work with GAMS 22.5 or older. To increase the confusion, GAMS also distributes GDX2HAR and then it depends on the PATH order which version of GDX2HAR will be executed. Make sure you actually use the GAMS version of GDX2HAR and things should be ok. ViewHar is not distributed by GAMS so you need to convert the GDX to an older format first. You can use GDXCOPY for this. The underlying problem lies in unfortunate changes in the GDX API by GAMS. It should have been possible to make these changes transparent by adding new API calls instead of changing them. In general it is poor design to change existing API calls as can be seen from this example. How to call GAMS from Excel using VSTO? VSTO = Visual Studio Tools for Office (see http://msdn.microsoft.com/en-us/office/aa905533.aspx). This allows you to develop .NET code for use with Office applications. Basically newer versions of Office both host VBA and .NET. VBA code is stored embedded in the .xls file, while .Net is maintained outside the spreadsheet. MS Visual Studio has excellent tools to develop, debug and deploy VSTO based applications. The VBA code presented in http://www.amsterdamoptimization.com/packaging.html can be ported to .NET/VSTO without much problem. It is the responsibility of the modeler to check every occurrence of FLOW() in the model equations to make sure no FLOW(i,j,k) outside the set LINKS is referenced. This will check that you don't use flow outside its LINKS domain. As I understand it GAMS/COINSCIP can only be licensed to academic users. I am not a lawyer but I suspect this may violate the COIN CPL license (http://www.ibm.com/developerworks/library/os-cpl.html). "Subject to the terms of this Agreement, each Contributor hereby grants Recipient a non-exclusive, worldwide, royalty-free copyright license to reproduce, prepare derivative works of, publicly display, publicly perform, distribute and sublicense the Contribution of such Contributor, if any, and such derivative works, in source code and object code form." It is possible to use a different license as long as: it complies with the terms and conditions of this Agreement. As GAMS/COINSCIP is part of any GAMS distribution I would guess I qualify as a Recipient. The GAMS/IDE will ask and try to update an open GDX file if the GDX file has changed. This is especially the case when the IDE gets the focus again. In some cases it will try then to reload the GDX file while GAMS is writing to this file. This results in a run-time error. The IDE does not crash: it will show a popup window with the run-time error but will continue to work otherwise. Preferably the IDE should not reload a GDX while it is being written to. >Hi all, does anybody knows how to attack a problem like the following ? >All ideas will be appreciated !!!! Just by numerically evaluation or sampling it is very difficult to prove anything. There is a tool to estimate whether a problem is convex: MProbe. If one would have a problem formulated in GAMS, the behavior of BARON can tell you if a model is convex (no branch-and-bound). It would be a useful to have a "dummy" solver that would tell us if a problem is convex. Essentially just the first phase of BARON without actually solving the problem. Some clients want to see how GAMS LP/MIP solvers perform vis-a-vis LPsolve. To this effect I created a small tool to convert LPsolve models to GAMS. Then you can run the GAMS model against any of the LP/MIP solvers available with GAMS. The median (http://en.wikipedia.org/wiki/Median) can be found by minimizing sum(i, abs(x-a(i))). This is not a well-defined optimization model, and many solvers have problems with it. Minos 0.5002 4.9424 The current point cannot be improved. Snopt 0.5002 4.9424 The current point cannot be improved. Ipopt 0.5002 4.9424 Restoration Failed! Baron mentions on the log that bounds are converging to 0.494241D+01, but in the listing file it says Best possible = -1E50. While implementing a recursive descent parser for Excel formula's I noticed the introduction at http://en.wikipedia.org/wiki/Recursive_descent_parser. We'll check what happens with upcoming 22.8 version. It is possible to perform a matrix inversion using a standard LP solver. 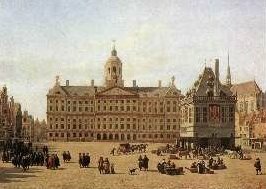 See http://www.amsterdamoptimization.com/pdf/lineq.pdf for a detailed description and examples of how this can be achieved. Sometimes it is quicker however just to call an external program to calculate the inverse of a square matrix. The program uses LAPACK's DGESV subroutine. The program can efficiently invert matrices up to (1000 x 1000). For bigger matrices, the dense inversion routine becomes slower and memory requirements become large. A GAMS external program (invoked by $call or execute during respectively compile time and execution time) cannot write messages to the listing file. It would be useful to have this capability. Some minor edits are needed for Delphi 2007. My models tend to show a relatively small percentage of time spent in the 2nd derivatives (not sure if you can conclude from this I am a good modeler). But if you have a model that shows poor timings here, I am sure the GAMS people would like to know about this, so send the model to support@gams.com. Furthermore, in such a case you may want to check if AIMMS does better on your model. It looks like the Lahey/Fujitsu fortran compiler does not trap divisions by zero. The code will continue with a NaN value. To generate traps add the compiler flag: -trap d.
(click to enlarge). Instead of solving for all periods at once we solve here in 5 steps. In each step the green part indicates binary variables are relaxed (continuous between zero and one). The yellow part indicates integer variables that are being solved for. The blue part indicates integer variables fixed to their previously found solution. Optionally we can try to improve the solution using a complete model (this is the grey part in the picture). Here we use the trick that X.PRIOR=INF means that X is relaxed. The final model uses the Cplex MIPSTART option to branch towards the solution found by the rolling horizon algorithm. In general it is important to make big-M constants as small as possible. > But, the sample i post is really a simplification for the question. > values for any [Rn] can be bigger than 1.000.000 ($). > value by a common factor (p.e: /1000) ? Otherwise look into Indicator Constraints as offered by Cplex. Currently Ctrl-Z can only undo up to the last time the Run button was pressed. In some cases it can be helpful to provide undo support also for changes before that point. I believe this is only cosmetic and that no lines with valuable information are lost. 32 bit GAMS under 32 bit Windows gives you a 2 GB process limit in theory (in practice this is 1.6 GB). See http://www.prophotowiki.com/w/index.php/IncreaseUserVa for notes. Warning: you may want to ask your system administrator to do this for you. 32 bit GAMS under 64 bit Windows. This gives you close to 4 GB. 64 bit GAMS under 64 bit Windows. This gives you even more. Some NLP solvers still have a 8GB limit but otherwise you can go much higher. Note that 64 bit GAMS is using more memory than 32 bit GAMS (pointers are 64 bit instead of 32 bit). So if you only have 3 or 4 GB RAM it does not buy you much using the 64 bit GAMS version. It is not clear why GAMS/Xpress terminated here. The objective is a function of discrete variables only: jumpDist 1. Type of presolve applied: MIP presolve. This may be a bug in the link instead of Xpress per se. Workaround: run again with default options will probably help. The model below does not terminate. One would expect the Interrupt button would allow you to stop the GAMS run. Unfortunately that does not work. Only the Stop button works but that stops the process very abruptly leaving an unfinished listing file. we currently add a dummy objective to an overdetermined system of linear/non-linear equations. It would be nice if GAMS has a model type say LINSYS and NLSYS that allows to express such a system of equations. There is CNS, but that requires a square system of equations. > from VBA using CreateProcess). but if we were to be able to get rid of the integer restriction on x also, we would not need MIP solvers anymore. See also the social golfer problem http://www.cs.brown.edu/~sello/golf.html.The difficult problem mentioned there has been solved using somealternative mathematical method (I forgot the details). Analog to this problem we can minimize the number of times player A can meet player B. If this becomes 1 no player meet another player more than once. Mathematics, University of Huddersfield, 2001. The GAMS/Cplex docs contain some section headers that are messed up. (Actually with LaTeX this usually works correctly; you really have to mess up the input to achieve this). I don't think any important information is missing. Looks to me using some homotopy method for this is inappropriate (I thought these were for nonlinear problems instead of discrete problems). It would be helpful if the edit boxes in the Find/Replace window would be larger if the window is enlarged. Long paths are not completely visible using the default sizes for the edit boxes. Click on the picture to see what I mean. The edit boxes should/could scale with the window size. In both cases Ctrl-T should remove blanks up-to the first non-blank character. However it will also remove the // and - characters. If this happens, use Ctrl-Z to undo. http://www.mirekw.com/winfreeware/mwsnap.html is a useful tool to create screen shots. I use it a lot. F3 does not repeat a search/replace operation (it becomes a search only). Sometimes it is useful to verify each search/replace and F3 can be used to do this. However, in the GAMS/IDE F3 does not repeat a complete search/replace operation. Demonstration of numerical issues in LS calculations. A numerically sound method is documented in http://amsterdamoptimization.com/pdf/regression.pdf. The above model can then be coded as: http://amsterdamoptimization.com/models/regression/longley.gms. The results are listed in the column "LS Solver". When storing a GAMS symbol each nonzero in a separate row in Excel, we quickly run out of space on older versions of Excel. Excel before Office 2007 could only handle up to 65,536 rows. To display larger pivot tables, we can write the GAMS symbol to a CSV file and use this CSV file as external data store for the Excel pivot table. This allows for larger data sets than the above mentioned row limit. See also http://www.amsterdamoptimization.com/pdf/toolhelp.pdf. 1 nonlinear objective; 10 nonzeros. GAMS has some similar facilities built in the LGO solver, but these are not available as a general feature. See http://groups.google.com/group/sci.op-research/browse_thread/thread/78456e35ddfc7141. This is actually a question that is often asked. The answer is really dependent on the situation. In this case the single case digests the input during compile time (using $include). This can not be coded directly by placing a loop around it (a loop is runtime). In this case it would probably the easiest the implement the single case as a complete GAMS file passing on the name of the input file and the output file as command line parameters. I.e. Note: the $if statements allow the model to be run outside the loop as well.
" --input=E:\simuldata" i.tl:0 "\datag" i.tl:0 ".xls "
Probably the best is to consult support@gams.com as this is very hairy. Often it is better to reorganize the data flow and read all data in the beginning, then perform a loop to calculate the results, and then export all results. The input data and results have then an extra index. In my experience this is very difficult to explain. The put_utility syntax should really be replaced by something more elegant (not a very high bar). Notice that we need a put file around even if we don't use it. It should not be too difficult to hide this from the modeler and handle this inside GAMS. See http://groups.google.com/group/ampl/browse_thread/thread/10861bd79114dfec. In GAMS we have the GAMMAREG function (see http://www.gams.com/~erwin/specfun.pdf) so no need to program this yourself using external functions. Both first and second derivatives are available for solvers calling this function. This seems allowed but has unexpected results. This will go to a gdx file 'xllink.gdx'???? 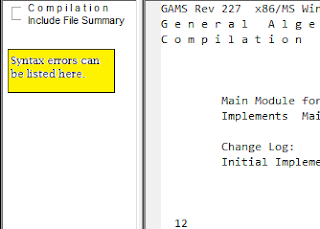 Be warned: this construct will overwrite any file xllink.gdx even though you did not specify this filename in the GAMS model (luckily chance is pretty small). Currently we cannot do this: there is no facility to append. The LST viewer can be improved by allowing easy navigation to syntax errors in the listing file. In many cases you don't even need to consult the listing file to fix errors using the IDE, but sometimes it is needed to inspect the listing file. (The previous is an example). This may help to find syntax error messages in the listing file (especially when there are comments with stars so searching for **** is not convenient).